Hundreds of households and vast areas of agricultural land in the Mekong Delta Provinces are under threat of landslides after the floodwaters inundated the region. 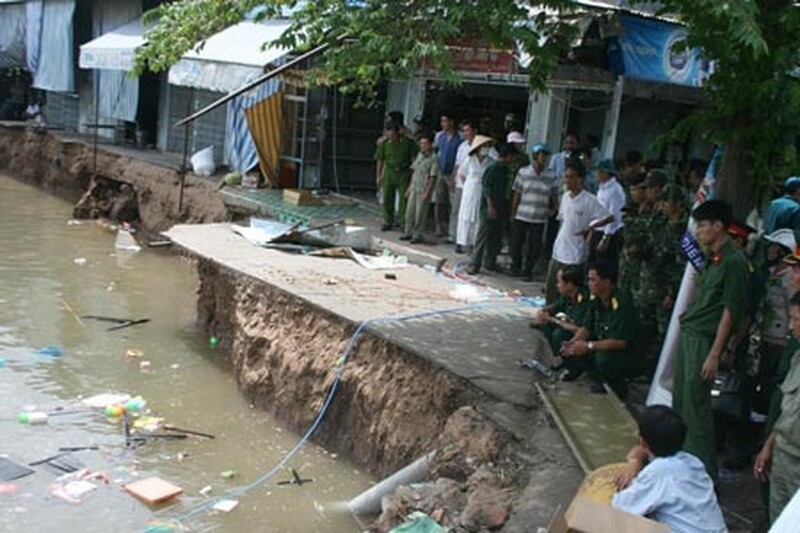 Scene of the landslide at Long Hoa Market in Binh Thuy District in Can Tho Province. Last weekend three landslides occurred in Binh Thuy Commune in Chau Phu District of An Giang Province, prompting local authorities to relocate 21 households from high risk zones and shelter many of the others who may face a possible similar threat. Authorities in Chau Phu District had to relocate more than 60 households living along the riverbanks in Binh Thuy Commune. As per the steering committee on storm and flood prevention in Hong Ngu District of Dong Thap Province, there have been seven landslides along the Tien River since August. Landslides have swept away more than 170,000 square metres of agricultural land and at least three houses. 40 other households had to be relocated from danger zones, causing a loss of more than VND2 billion. At present, a 20 kilometre stretch along Phu Thuan B, Long Khanh A and Thuong Phuoc 2 communes of Dong Thap Province, is facing a high risk from landslides. Authorities in Hong Ngu District relocated more than 300 households to safer ground as Dong Thap Province has many hot-spots that could face a landslide at any time, such as An Lac Ward, Tan Binh and Tan Quoi commune of Thanh Binh District. Similar situation prevails in Can Tho City. More than 30 households living along Hau River are being threatened by rapidly occurring landslides. Meanwhile, floodwaters from upstream are continuing to gush into the Hau River and each year landslides sweep away about two hectare of land from Con Son Island.